Chop the carrot, celery and onion. Place the various cuts of meat into separate vacuum packs with a drop of capon stock and the mixed vegetable cubes. Cook the meats in Roners, setting them at different temperatures: veal tail and head at 63°C for 36 hours, cheek, tongue and belly at 63°C for 24 hours and cotechino at 63°C for 16 hours. 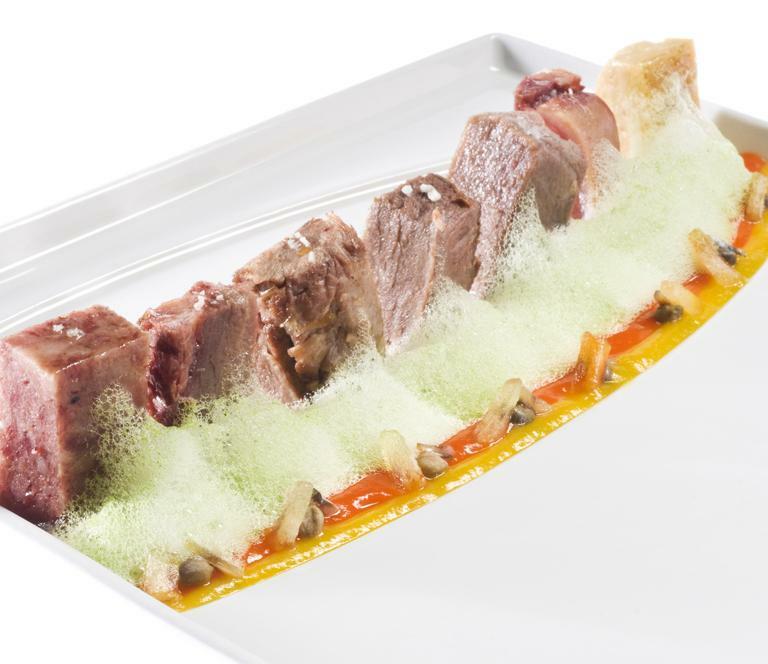 When it is time to serve, mix the cooking juices, balancing them to suit preference (the cooking times are related to the ingredient used at Osteria Francescana). Place the vinegar, sugar and water in a saucepan. Reduce the elements to half the initial amount. Add the previously roughly chopped pepper to the reduction. Cover the pan and cook on a low heat for 5 minutes. Leave everything to rest for 30 minutes. Blend in the Bimbi, sieve and add 4.5 g of Gellan. Heat the liquid to 95°C. Spread the hot pepper jelly in the middle of the plate, using a round mould with a diameter of 8 cm. Add the finely chopped anchovies, apple chutney in small pieces and capers. Scald the parsley for a few seconds and plunge immediately into cold water. Drain and dry the parsley. Place it in the Bimbi with water, salt, sugar and Citrus, blend together and sieve. Use the Bamix on the highest speed to make the parsley air after adding the lecithin to the liquid. Place the onion is a copper pan with sugar and butter. Cook on a low heat for about half an hour to absorb all the liquid. Add the red wine and balsamic vinegar. Cook until completely evaporated, in order to obtain a classic jammy consistency. Cut the apples into small slices and place with lemon and sugar in infusion for 2 days. Using a 45 cm diameter copper pan, sauté the apples, adding the marinade a little at a time. Complete by dissolving the mustard drops in the final ladle of liquid added to the pan, allowing it to absorb.